Try out a kosher’s take on the traditional Chicken Kiev. 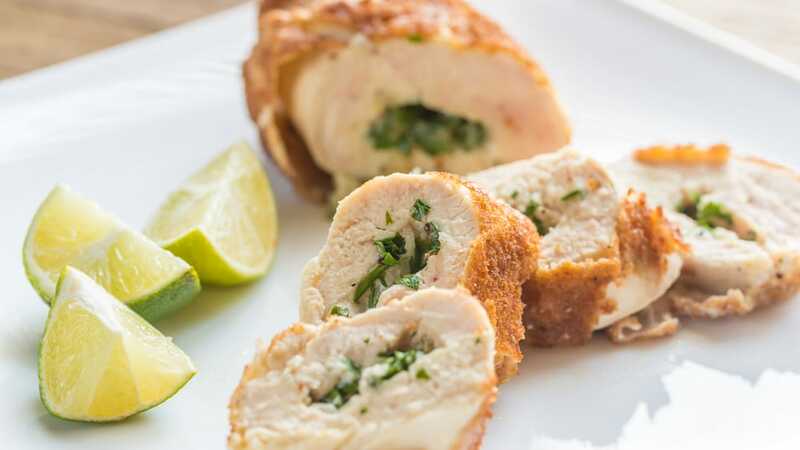 Originated from the Russian Empire, Chicken Kiev is made of tenderized chicken coated in eggs and bread crumbs then beautifully fried or baked in an oven. Try this recipe out for your next family dinner as it serves 16 and takes approximately 75 minutes including preparation and cooking. 2. Combine margarine, garlic, and herbs in a small bowl until well mixed (Use food processor if desired). 3. Place a tablespoon of this mixture at end of each chicken cutlet and fold over sides. As you roll each piece of chicken (away from you) to completely enclose the margarine. 4. Press seam to seal well and secure with toothpick if necessary. 5. Refrigerate rolls for 30 minutes and up to overnight. *Don’t pound cutlets too forcefully. Any tears in the chicken could allow margarine to escape when frying. 2. Combine flour, salt, and pepper in large flat plate. 3. Beat eggs and water in a medium-sized bowl. 4. Place the bread crumbs in a large flat plate. 5. Dredge chicken rolls in the flour mixture, then dip into the egg mixture and finally into the bread crumbs. Set aside. 6. Heat oil in a large, deep frying pan and fry rolls on both sides until golden. Approximately 5-8 minutes on each side. 7. Place fried rolls in a large pan lined with parchment paper and bake for 15 minutes until crispy and cooked thoroughly.